learn it. love it. live it! Join us (and some new maker-friends) to learn to sew and craft! Whether it be garment sewing, quilting, making your clothes fit just right, learning to use a machine, or crafty crafting… we've got a class for you! Check out our class descriptions and availability below. You say you want a revolution, well you know... we could all learn to sew! Now seriously, how revolutionary would THAT be?! Come on in to get acquainted with the good, ol' sewing machine. This class will teach you the parts of the machine, the basic stitches, and the beginning ground rules for sewing (free tip: never put your finger under the needle, ever!). You'll come out with handy, dandy throw pillow cover. Plus you'll be ready to move on to the great beyond in the world of classes - a WHOLE NEW WORLD! To really sink sewing into your bones, we’re taking you through a four week journey of projects and learning. This series will teach you the basics of your sewing machine, talk about tools that will help you on your sewing machine, touch on choosing the right fabrics for the job, and more! You’ll come away with three finished projects and the skills (and hopefully confidence!) to make sewing part of your life. This series is great for those who are committed to learning and ready to jump in and those who know the basics but want to really sit down and practice. ** Projects or project schedule may vary depending on instructor. The instructor will send out a specific materials list prior to class. This will include a few yards of fabric, thread, and other small notions. Sergers might be the game changer of the sewing world, but that doesn't make them any less scary! Join us as we walk you through how to make that machine work - from threading to tension to making it run! Serger! As this is a completely hands on class, we recommend you bring a serger with you. We have one in studio that 1-2 students can use, but want you to get the most time on a serger as possible. We've had great success with the Brother 1034D. Scraps of fabric - Bring all different types (knits, cottons, rayons, etc.) to practice on! We're taking the zipper pouch to a whole new level - the ZIPPER PURSE! Join us to learn how to learn a slew of skills while making a sure-to-be-loved bag - sewing in a zipper, adding pockets, adding straps, and corner gussets! This is a great next step for early sewists and will still hold fun and skills more more advanced beginners. Excited to make that first garment or looking for some comfy pants and a quick and satisfying project? Join us for some fun and learning while you make the ever loved Pants No. 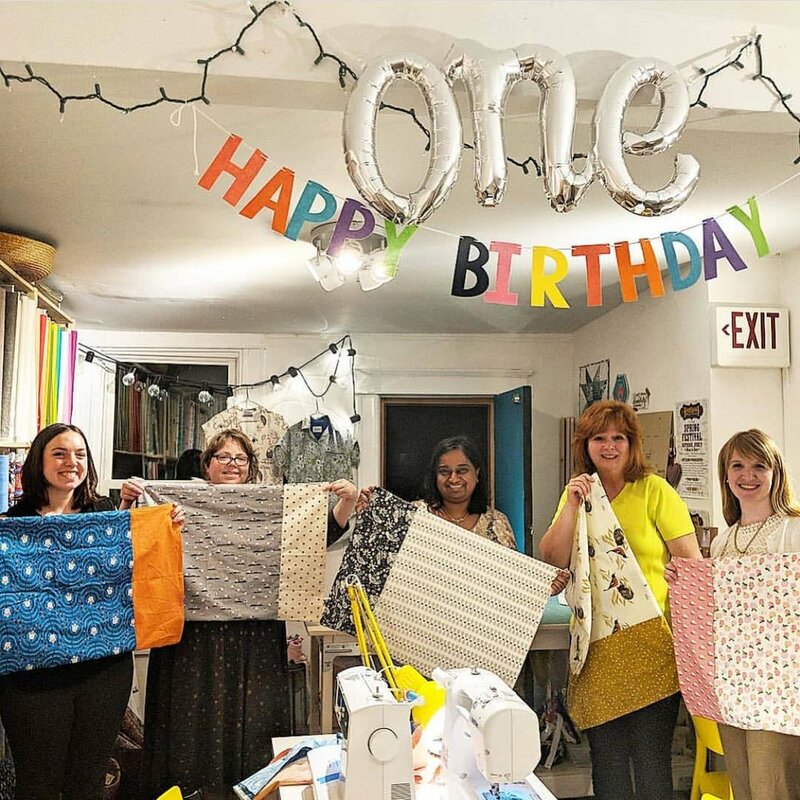 1 by 100 Acts of Sewing! This class is a great project for newer sewists and more seasoned ones who just want to have some social sewing! You'll come with the fabric and pattern cut and prepped and construct the garment in class with instruction. This pattern is great for most woven fabrics and is sized XS-4X! Tools: Tools (scissors, cutting mat, needles, seam rippers, machines) will be available for use, though supplies are limited. The shop will be open for purchases (fabric, thread, etc. ), but you are also welcome to bring your own materials from home. If you've been eyeing quilts enviously but are scared to jump in, then THIS is the class for you - come learn the basic skills with us by making a beautiful half-square triangle quilt! In five weeks you will be taught to cut, piece, baste, quilt, and bind while creating a unique blanket that's all your own. Spend the winter with a cozy weekly sewing night making something that you'll love for years to come! If you're on the hunt for that *perfect* summer dress, then look no farther! The Kalle Shirtdress is the perfect loose fitting dress to take you through the warmer months. In this intermediate class, you'll learn how to make plackets, a collar, curved hems, and buttons. The dress can easily be a top, tunic, or dress and is great with a variety of fabrics! Patterns often tell us to “finish your seams” but what exactly does that mean? Is there a way other than zig-zag?! Welp, we’re here to tell and show you that there re MANY other ways! Take your sewing up a notch by polishing (and learning about!) your seam finishes! You’ll learn all about ten different types (including French, flat fell, and Hong Kong!) as well as when to use them while practicing on scraps on your machine. Your future makes will come out better than ever! Tools: Tools (scissors, cutting mat, needles, seam rippers, sewing machines) will be available for use in the shop, though supplies are limited so you areen to bring your own as well. The shop will be open for purchases (fabric, thread, etc.) if you'd like to restock. Add a bright spot of hope to your life with one of the gorgeous paper pieced patterns by @HappySewLucky! These Tattoo Series Quilt blocks are lovely reminders that can be framed, quilted, used on a pillow, or on the front of a bag – the options are endless! You will learn how to paper piece while creating a 10”x16” rectangle (that can be framed to create a square). Come join us to learn this great scrap busting art!! Skill Level: Adventurour Beginner/Intermediate sewist (comfortable with the machine and have made some projects beyond beginner class). Get ready for SUMMA, SUMMA, SUMMA-TIME with the ever amazing Poolside Tote! This large bag will be your summer catch-all for towels, suits, snacks, water, and sunscreen as you hit the pool and beach. Form and function at it's finest - you won't be disappointed! Have you wanted to tackle making your own undergarments, but feel a little intimidated? We’ll take a step-by-step approach to making a pair of super comfy underwear/ Scrundlewear! In this class you will get familiar with sewing knits on a small scale. If you own a serger (and are comfortable with it) you are welcome to use that in class. Our class will focus on sewing the knit waistband and knit legs version of the underpants. You may choose to cut either the briefs or boy- shorts. (Make sure you cut your pattern accordingly). Hand stitching is a relaxing and meditative process. It is incredibly rewarding to take the time to slow-stich a garment to add something special to your everyday wardrobe. In this class we will focus on making a simple basic staple piece from start to finish - sizing, cutting the pattern and fabric, and constructing the garment. Jersey is very forgiving, easy to handstitch, and the fit of this t-shirt is relaxed. Sizes XS to XXL are covered in this pattern. This pattern, and the skills we will cover, can also be used as a first step towards making a highly embellished, one-of-a-kind work of wearable art! **If you’d prefer to make a dress or more fitted shirt we have Alabama Chanin pattern options for that too! Alabama Chanin Unisex T-Shirt Pattern ( https://alabamachanin.com/products/classic-unisex-t-shirt-pattern) printed (and assembled if necessary). Follow directions in Step 1, paragraphs 1 and 2, of the pattern for printing tips. Itching to sew your own apparel? Start here!! The first step to sewing your own beautifully fitting and unique clothes. You will learn how to pick a sewing pattern for your size, understand the basic instructions, how to lay out your pattern, and how to cut and mark your fabric. This class is part demo / part interactive and prepares you for the garment making ahead! Materials Needed: All materials will be provided. Your first sewn garment! We'll walk and talk you through a pair of loose fit unisex lounge pants. This versatile pattern can be used for children-adult, xs-xl, so make them for you or as a gift for a loved one! This class will reinforce your basic sewing knowledge while teaching you the basics of garment construction as you create your own comfy pants. Who doesn’t love having that perfect, well-worn, great fitting tee as their go to shirt? Make your own while learning to sew knits! This class will lead you through a fitted knit tee shirt using your zigzag sewing machine. You don’t need a serger to sew a well fitting professional looking tee shirt! This class will also include a demo of serger techniques, but the knit tee shirt construction can all be done on your home sewing machine. A pattern that can be used for day or night, home or work, this beautiful kimono will become a go-to. This class walks you through self bound seams and is flattering on all. Try it in a flannel for home, or give a go at a silkier rayon or lightweight woven for an airy and drapey fit. Ease yourself into fitted apparel with this lovely slightly structured tank. Your first foray into fit adjustments, you will first make a muslin to tailor it to you. From here you can confidently cut into your fabric knowing that it’s made for you. let us know! Contact us at create@domesticitystudio.cOm or 443-885-0369! If you have a small group of 3-5 people and are interested in doing a class listed (or have an idea for another project!) please let us know. We love to accommodate small parties and can try to find a time that works for you and your friends to learn together. This is great for birthdays, bachelorette parties, or just friends who want to learn to sew! Have a group of 3-5 and want to do a class together? Have a suggestion for a class that you'd like to see? Have questions about whether a certain class is right for you? Have a sewing conundrum that you're not sure can be solved? Newbie: You've never touched a machine, or it's been YEARS and you're rusty. Novice: You know how to sew straight lines and use a sewing machine. Intermediate: You hang pretty well on your own, but still have things to learn, like a new type of sewing (apparel, quilting, paper piecing) or certain techniques. Advanced: Your sewing machine and you're one, but you need tips and tricks in a specific area to take it above and beyond. All classes require registration and prepayment. Cancellations: No refunds are offered for classes. Your cancellation at least 72 hrs/3 days in advance: You may use your class fees for another class. Your cancellation with less than 72 hrs/3 days notice: You may forfeit class fees entirely. Please email create@domesticitystudio.com or call 443-885-0369 if you need to cancel and we will help you as best we can! Our cancellation: Classes may be canceled due to low attendance or other unforeseen circumstances. If so, we’ll notify you as soon as possible and offer a store/class credit. There is no guarantee that the same class will be available for a reschedule. Classes are for ages 16 and up unless labeled “KIDDOS” or similar. Great kids' class options are in the works! Please arrive up to 15 mins early to get set up. If arriving more than 15 mins late, call ahead (443-885-0369) or you may be considered a no-show and forfeit your class fees. Please complete any “homework” assigned between multi-session classes. If you need a machine to complete homework, we will gladly let you use the studio space during business hours to wrap up your homework. As everyone works at different speeds, you may not finish a project within the class period. If you are not able to finish within the class period, we will gladly let you use the studio space another day to wrap up your project.